So occasionally I like to prattle on about altering your clothes. This will be no exception. Generally, as long as you weren’t drunk at the time, when you buy something it’s because there is something you love about it. Sometimes it’s because it fits perfectly. But sometimes it’s because the color makes you happy, like hot pink, or it has a detail you just can’t resist, like the neckline. In these cases we often don’t end up wearing the item because it doesn’t fit. That is usually a very simple fix. First and most obvious was that if I pulled the dress down so that it lay flat on my shoulders, the seam at the waist sat way too low. 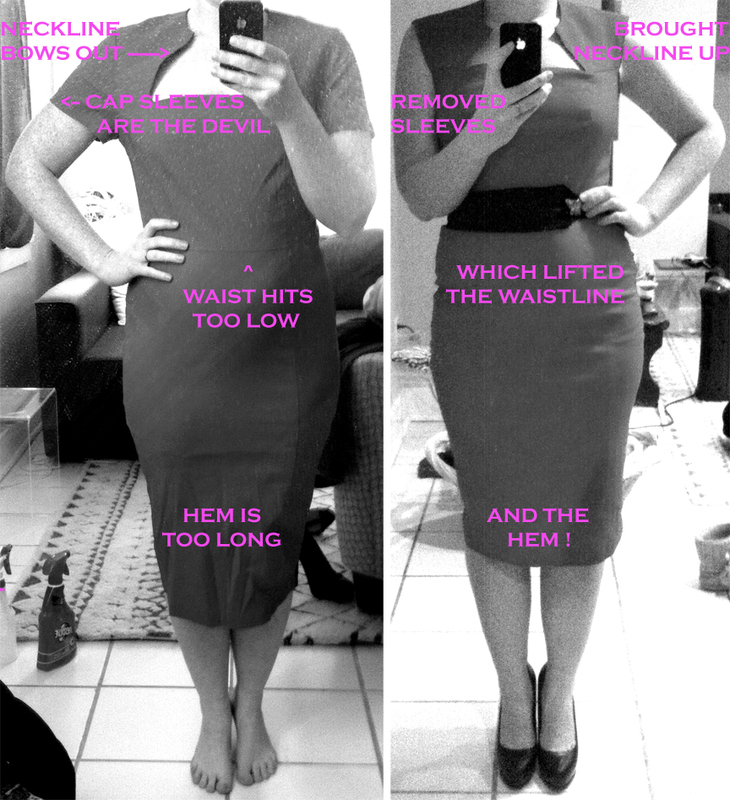 This is because the distance between the shoulders on the dress and the seam at the waist was much longer than the distance between my shoulders and waist. This also caused the dress to be too long and shimmy upward as I walked. We’ve all been there, trying to enjoy a party and endlessly tugging at our skirt instead. It was probably meant for someone a few inches taller. I probably should have gotten a petite which would have solved all of these problems. The other issue was the cap sleeve. When I bought it I was intending to wear it around some very conservative, religious types and possibly in a church, hence the sleeves. Then, when I got it I said who the hell thought this was a good idea? Word to the wise, a cap sleeve, one that ends anywhere higher than mid-bicep and anywhere lower than your collarbone, is a mistake. NO! Don’t argue with me! It’s a mistake. The argument for a sleeve is usually made by people who don’t like their arms. A cap sleeve will only make whatever flaw you think you have, worse. You’ll see it in the pictures trust me. And at that point it’s already too late. There’s nothing that can be done. Burn the photos and forget this ever happened. I don’t care if it’s the only photo you have from your brother’s wedding. Burn it! A simple sleeve removal and a new pinched seam just under the arms and all is well. I’ll still probably never wear it but that’s not the point. I could wear it… and that’s all the consolation I need.